Review: "Murmur: Murmur" - Sea of Tranquility - The Web Destination for Progressive Music! Here we have the self-titled release from Chicago's experimental black metal act Murmur, their fourth album overall and first for Season of Mist. Honestly, calling much of this black metal is somewhat of a stretch, as the band more often than not dive into progressive rock, avant-garde, jazz, sludge, and post rock waters, far removed from what most of us would call black metal. 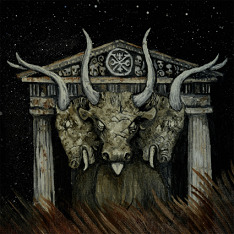 Take the stellar "Bull of Crete" as an example, a complex, extended piece that recalls Red era King Crimson, or the wonderful "Al-Malik", that again veers off into Crimson styled '70s prog but with a touch of Mastodon. Yes, "Water From Water" is pure vengeful US styled black metal, and the creepy two part "Zeta II Reticuli" contains some raging, avant-garde moments that wouldn't be out of place on a Wolves in the Throne Room album, but for the most part Murmur's love for vintage '70s prog is purely apparent throughout the album. Check out the sprinkling of jazzy keyboards, lilting guitar strains, and melodic vocals on the lush "When Blood Leaves", a tune that opens as a lovely prog track before some serious sludge starts to take over. And, it comes as no surprise that they throw in a daring cover of Crimson's classic "Larks' Tongues in Aspic" to show you where their roots lie. It's quite true to the original, and really well done. As I haven't heard Murmur's previous releases, I can't really compare this to what they've done before, but I can say that this band seems serious about venturing into their progressive rock side based on what's on display here. Prog fans need not be cautious about the black metal tag that follows this band-this is is certainly modern prog rock with a dark twist, and pretty damn good.